R W stands for Russel W Robinson. According to an article in the January to June 1907 records of the “American Druggist and Pharmaceutical Record, Robinson entered the drug business in the late 1840’s and formed the firm of R W Robinson & Son in 1870. He died in 1883. The NYC directories support and add to this information. Robinson moved to 182 – 186 Greenwich Street in and around 1857/1858. Russel W Robinson was still listed individually in the 1883 directory but was not listed in 1886 (the next directory I have access to). The business continued to be listed at Greenwich Street. In the 1897 and 1898 Trow Business Directories for Manhattan and the Bronx, the company remained listed at the Greenwich Street address and an address at 228 Fulton Street was added. R. W. Robinson & Son, New York, to deal in drugs; capital $80,000. Directors – F.M. Robinson, W.R. Robinson, D.W. Kent, New York. After incorporation, the company name became R. W. Robinson & Son Company. It was announced by Charles S. Littell, George Thompson and Theodore W. Day that they have resigned as directors of the corporation of R. W. Robinson & Son, Co., severing their connection with that concern, and have formed a co-partnership under the name of C. S. Littell & Co. They will do a wholesale drug business at 228 Fulton Street. The new firm has leased the Fulton Street section of the old building, leaving the Greenwich Street side, which forms an “L” to 186 Greenwich, to the Robinson firm. which will continue in business. The two buildings are, in fact, separate and distinct, being connected by a passageway. Charles S. Littell, who is prominent in drug trade circles as chairman of the Drug Trade Section of the New York Board of Trade and Transportation, started with the Robinson firm thirty-five years ago as a boy and for twenty years was a partner in the old firm of R. W. Robinson & Son. During the past two years he has been vice-president of the present incorporated company. Mr. Thompson and Mr. Day have both been connected with the business for over twenty years. There must have been more to the situation than reported in the story because a little over one year later, R. W. Robinson & Son was bankrupt. A bankruptcy notice, that listed assets of $24,184 and liabilities of $156,569 was printed in the October 31, 1907 edition of the N Y Times. A day later, a bankruptcy sale was announced in the paper. The notice provided a description of the business at that time of the sale. It included: a complete manufacturing, wholesale and retail business together with a laboratory. Their property included drugs, chemicals, proprietory medicines, formulas, trade names, office fixtures, typewriters, etc. C. S. Littell was still listed at 228 Fulton Street in the 1919 Copartnership and Corporation Directory. At some point in the early 1920’s they moved to 330 Spring Street and I don’t see them listed in the 1930’s. Other proprietary medicines they were associated with in advertisements include “Dr. Clark Johnson’s Indian Blood Syrup,” the “Old Squaw’s Cure” and “Dr. 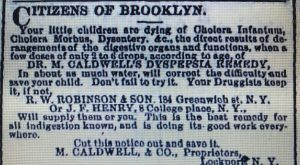 M Caldwell’s Dyspepsia Remedy.” An 1873 advertisement for Dr. Caldwell’s from the Brooklyn Daily Eagle is included below. The 182 -186 Greenwich Street and 228 Fulton Street addresses no longer exist and the location is currently within the footprint of the World Trade Center site. The bottle I found is a small medicine (approximately 4 oz) with a tooled finish. It’s embossed R W Robinson & Son and fits with the 1870 to 1907 time frame of the company (probably late 1800’s). There’s no address embossed on the bottle. Nauheim is a business that went from a single druggist named Simieon Nauheim in the late 1870’s to a chain of drug stores that lasted into at least the 1930’s. To Our Brother Pharmacists: All trades and callings in our time strive to bring about shorter hours of work. Why should not we also? Therefore, we the undersigned, hereby agree to close our stores on and after October 20, 1888 at 10 o’clock pm. 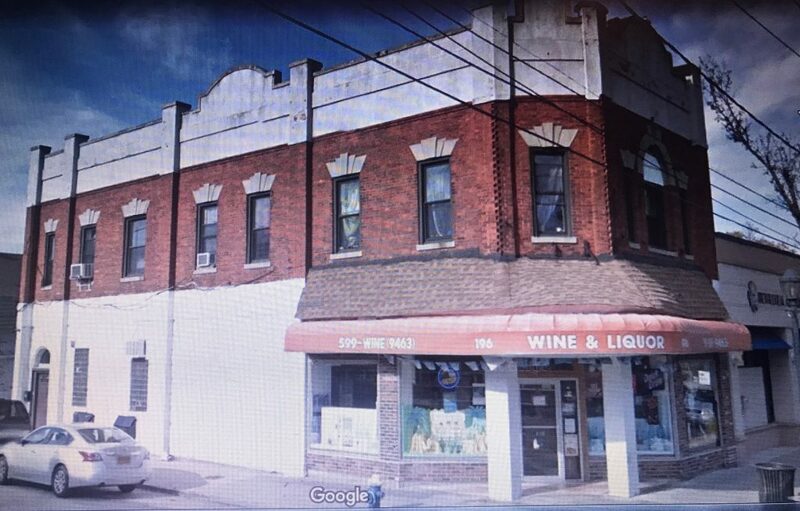 S Nauheim sold his building on the southeast corner of 59th Street and Lexington Avenue and will move his drug store to No 750 Lexington Avenue between 59th and 60th Streets on the west side. It is said Mr Nauheim realized a handsome profit on the sale of his property. Around this time, a business card advertisement in the 1902 Issue of “Round About New York” calls Nauhein a Druggist and Dispensing Chemist: “Perscriptions a specialty under my personal attention.” The 1905 ERA Directory indicated that the 750 Lexington Avenue location provided services in the following categories: drugs and medicine, drug sundries, tobacco or cigars, books or stationary and that the business had a soda fountain. The main store and offices of Nauheim Pharmacy remained at 750 Lexington Avenue well into the 1930’s. Simieon Nauheim, formerly proprietor of the S Nauheim Pharmacy at 750 Lexington Avenue, has sold the business, stock and fixtures of the store at that address to James Lurie and Abraham S Stoller. The well known store of Carter and Robinson, 73rd Street and Columbus Avenue, New York City, has been sold to Stoller and Lurie, proprietors of Nauheim Pharmacies. This is the fourth store to come under their ownership. In October 1922, the Bulletin of the Merchants Association of New York listed them as a chain store under the drug heading. Thoroughness! It is the quality that for over half a century has developed a background of trust and confidence in the Nauheim Pharmacy. Thoroughness never ceases before the task is completed. From early morn to late at night seven days a week it finds continual expression in the Nauheim Pharmacy. New York’s most reliable apothecary. The bottle I found is small (maybe 1-2 oz) with a tooled finish. It has the Nauheim name embossed on it but no address. Embossing on the base indicates it was made by Whitehall Tatum Company (W.T. Co). The fact that there’s no ampersand (between the T and Co) indicates it was made after that business incorporated in 1901. A web site article on Whitehall Tatum puts the specific embossing in the 1901 to 1924 time frame. This most likely dates the bottle to the 750 Lexington Avenue address (or the last year at 741 Lexington Avenue). Muller’s Leading Drug Store, Merrick Road, Valley Stream, N.Y.
Census records indicate that Frederick W. Muller was born in Germany in 1874 and immigrated to the United States as a young boy around 1880. He listed his occupation as druggist in both the 1900 and 1910 census records. In December 1895, Mueller (later changed to Muller) assumed the management of a store owned by George A. Koch, a Valley Stream druggist. In 1897, Mueller bought Koch’s business, and in May 1900, he built his first store on West Merrick Road. The Historical Society’s post identified the location of his first store as 32 West Merrick Road (between Rockaway and South Carona Avenues). Frederick W. Muller was listed in the ERA Druggist Directory of the US, Canada, Cuba, Puerto Rico, Manila and the Hawaiian Islands in years 1905 through 1921. He’s not listed in the 1922 Directory. The 1905 ERA Directory indicated that he provided services in the following categories: drugs and medicine, drug sundries, tobacco or cigars, books or stationary and that the business had a soda fountain. At some point Muller moved his drug store to the northwest corner of Rockaway Avenue and West Jamaica Avenue. Doc Muller used the top floor of the building as a movie house, Valley Stream’s first movie theatre. Muller’s Drug Store has been purchased by Max Silver. After selling the drug store, Muller focused his attention on banking and real estate. 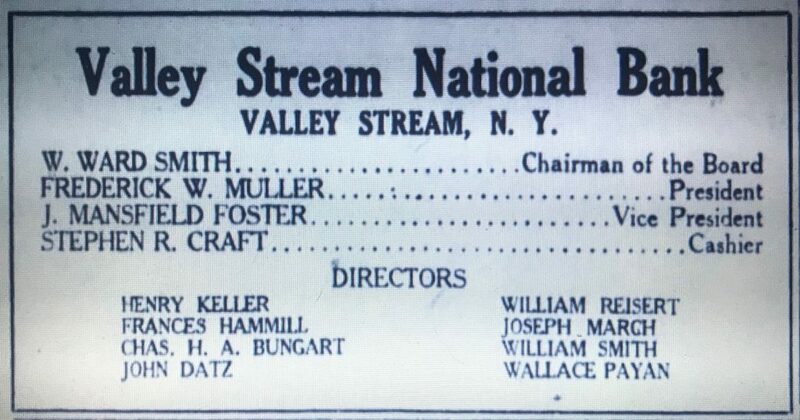 His wife Ida’s obituary named him as the founder and president of the Valley Stream National Bank and Trust Company. 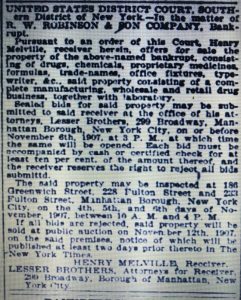 This notice, confirming his status with the bank, appeared in the January 9, 1924 issue of the Brooklyn Daily Eagle. Frederick Muller, a druggist and prominent citizen of Valley Stream L I while going home from his store late one night a short time ago, was sandbagged by an unknown footpad. After falling, the druggist still had sufficient presence of mind to pull a pistol from his pocket and fire three shots at the man who attacked him, who thereupon ran away. The building on the northwest corner of Rockaway Avenue and West Jamaica Avenue still exists today. It’s address is 196 Rockaway Avenue and it houses a liquor store at ground level where the drug store once was. The upstairs movie theatre appears to be an apartment now. The bottle I found is a small (approximately 5 oz) medicine with a tooled finish and the Merrick Road location embossed on it. Embossing on the base indicates it was made by Whitehall Tatum Company (W.T. Co). The fact that there’s no ampersand (between the T and Co) indicates it was made after the business incorporated in 1901. This dates the bottle between 1901 and no later than 1912 when we know Muller’s at the Rockaway Avenue location. Bernard Monderer, Druggist, Audobon Ave., Cor 179th St.
Bernard Monderer graduated from the Brooklyn College of Pharmacy on May 11,1916, successfully passed the examination of the NYS Board of Pharmacy held on June 28th and 29th 1916 and opened his own business sometime between then and 1920. Note that he’s not listed in the 1916 ERA Druggist Directory of the US, Canada, Cuba, Puerto Rico, Manila and the Hawaiian Islands but is listed in the 1921 and 1922 Directories at 278 Audobon Avenue (at 179th Street). He included his business card, showing the same address, in the 1937graduation program of the Talmudical Acadamy of Yeshiva College so the business continued into the late 1930’s and probably further. It could have lasted into the early 1960’s when construction of the Trans Manhattan Expressway would most likely have forced him to relocate or possibly put him out of business. The bottle I found is a small (4 oz) medicine with a tooled finish. Being mouth blown, it must be from the first few years of the business. 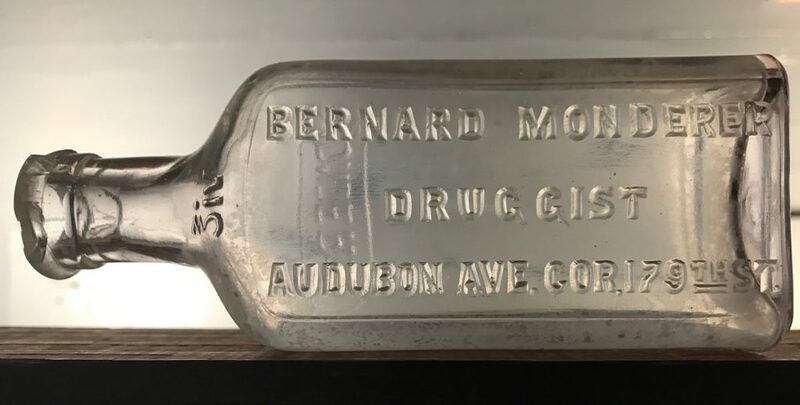 In response to this post, I was contacted by the grandson of Bernard Monderer, who confirmed that Bernard Monderer’s drug store occupied the first floor of 278 Audubon Avenue up until the time that the building was razed in order to make way for the George Washington Bridge expansion that included the Trans ManhattanExpressway. He added that Bernard lived right across the street from the store in 529 West 179th Street. He continued to live there, working as a pharmacist for hire at other stores up until his death in 1968 or 1969. The P stands for Peter B. Knapp whose business dated back to 1839. 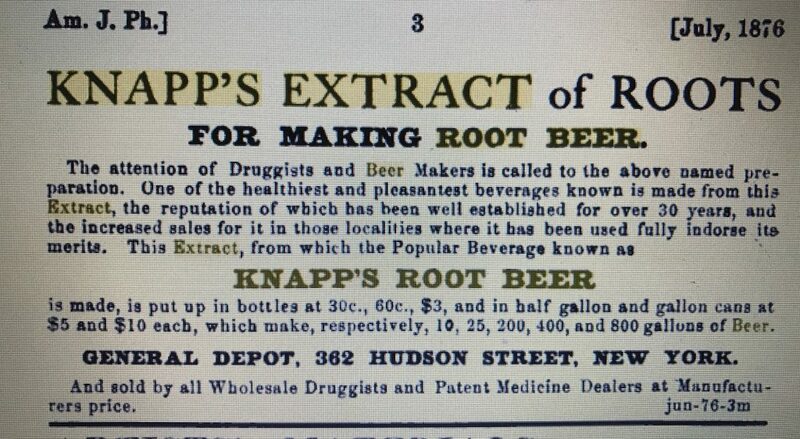 Knapp ran a medicine warehouse at 362 Hudson Street where he sold proprietary medicines, both wholesale and retail. The business is listed in the 1847 NYC Directory at that address and remained there through at least 1932. It was listed at (or more probably expanded to include) 373 Hudson Street and later 388 Hudson Street from 1933 to 1949 after which there’s no record that I can find. Knapp’s Celebrated Indian Strengthening Plaster. – These plasters prepared for pains and weakness in the back, breast, side or limbs, rheumatism, weakness and pain in the chest or loins, across the kidneys, or between the shoulders, liver complaints, diseases of the lungs, lumbago, bruises, sprains and other local injuries of a like nature. Knapp’s Indian Strengthening Plaster will prove, it is confidently believed, the most efficacious outward application that medical science has ever placed within the reach of suffering humanity. In 1877 the business was also listed as a New York agent for Dr Underhill’s Pure Wines. Peter Knapp was involved in the business through 1893, when as the Senior Partner an issue of Chemist & Druggist mentioned that he was one of the oldest druggists in New York. One hundred dollars would not do so much now, but in the year 1839 Peter B Knapp established a drug store with it. He had served a long apprenticeship at Van Kleeck’s on lower Sixth Avenue, and wanted to own a store of his own. He bought his stock and it was delivered to him, all in one load. People believed in home-brewed herb remedies in those days and knew how to prepare them. The little herbarium thrived. Cherished household recepies were brought there to be compounded. The forefathers of the present generation had there infantile colics soothed with catnip that could nowhere else be found of such full fresh flavor as at Knapp’s. It wasn’t so big a place then as it is now, and it wasn’t on the corner. As the business grew, the store deepened and the corner was finally taken in. The firm of P. B. Knapp & Sons now occupies the greater part of two buildings and an annex besides. In 1920, the Knapp family is apparently no longer involved with the business. The Directory for that year names August Hardinger as the only principal. The bottle I found is a small square mouth blown pharmacy bottle with a tooled finish. 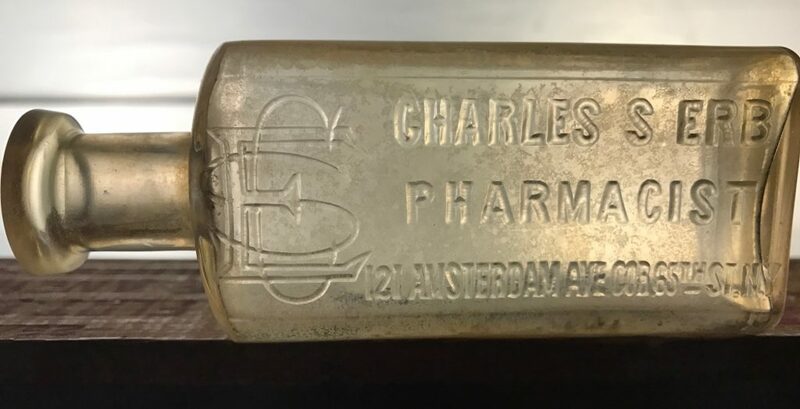 It has the 362 Hudson Street address on it and most likely dates back to their prescription department of the early 1900’s. John H Jones, drugs, was first listed in the NYC Directories at 977 Eighth Avenue around 1876/1877. They were not listed in the 1873/1874 Directory. Sometime between 1886 and 1894 they moved to 798 Ninth Avenue (at 53rd Street) where they remained through at least 1922. The 1905 ERA Directory indicated that he provided services in the following categories: drugs and medicine, drug sundries, tobacco or cigars and books or stationary. The 1912 and 1919 NYC Copartnership and Corporation Directories and the 1922 Directory of Drug Manufacturers and Proprietors listed the J F Abbott Company (Judson F and James L Abbott) at this address as well so it’s possible Jones either partnered with them or sold out to them in 1912 and remained with them through at least 1922. The IRT Ninth Avenue Line, the first elevated line in the City, ran right by the Jones Pharmacy. It was called the cable because originally the cars were propelled by a series of one-mile long cable loops that ran between the rails that were driven by stationary engines placed in buildings adjacent to the line. 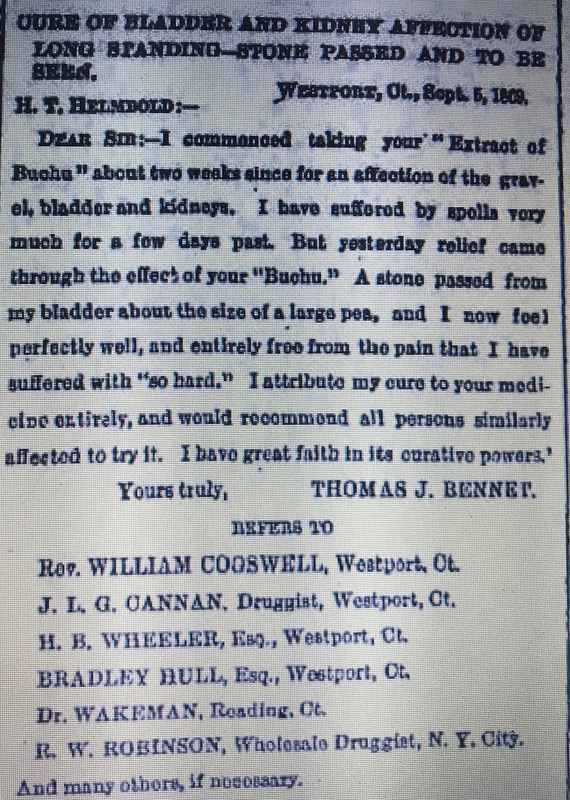 An 1895 Issue of the American Druggist and Pharmaceutical Record claimed that Jones was one of the biggest sufferers by the cable. His store was right at the corner of 53rd Street where the cable road made a very sharp curve. A number of accidents take place there and, as might be expected, the injured persons are at once carried into the drug store while an ambulance is being summoned or the exact state of the injured man’s condition is ascertained. During June (1895) there have been perhaps a half a dozen people carried into the store and temporarily treated. On each occasion, Mr. Jones suffered loss of goods from contemptible pilferers who must have gathered in the crowd and followed in, simply to steal whatever they could get their hands on. Today 798 Ninth Avenue is a five-story walk-up with a commercial store at street level. It almost certainly dates back to the business. The bottle I found is a small (approximately 4 oz) mouth blown medicine bottle with a tooled finish. Embossing on the base indicates it was made by Whitehall Tatum Company (W.T. Co). The fact that there’s no ampersand (between the T and Co) indicates it was made after that business incorporated in 1901. The Hegeman story dates back to the early 1800’s. According to “The Old Merchants of New York” by Walter Barrett, published in 1863, William Hegeman started working in the New York City Drug House of Rushton and Aspinwall at age 12. After Rushton and Aspinwall dissolved, Rushton kept one of the retail stores under the firm name of Rushton and Co and Hegeman became a partner. Rushton died and the firm became known as Clark, Hegeman & Co. When Clark left and his son joined the firm the name changed to Hegeman and Clark. 1855-1859 Hegeman, Clark & Co is listed at four different Broadway locations. 1859-1867 Hegeman & Co is listed for the first time in 1859. The locations listed are four Broadway locations and a Fourth Avenue and 17th Street location. William Hegeman is also listed with each location. 1867-1868 Hegeman & Co continues to be listed and in 1867, Johnston N Hegeman (assuming it’s a son?) is listed for the first time at each of the company locations. 1869-1877 In 1877 only two company locations are listed (203 and 673 Broadway) and William is no longer included at each location. A similar note is included in the 1886 Directory under J N Hegeman & Co: “Mr. 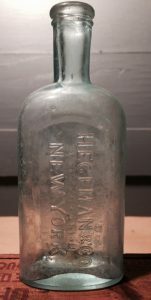 Hegeman is the only surviving partner of the old firm of Hegeman & Co and is the only Mr. Hegeman doing drug business in NYC. He has no connection whatever with any other drugstore in NY. In the same 1886 Directory Hegeman & Co is listed at 203 Broadway and it is now indicated as a corporation. J N Hegeman died in 1894 but the business remained listed in the NYC Directories through 1905. At a meeting of the officials of the William B Riker & Son Company and Hegeman & Co on August 4, negotiations were completed merging the two concerns into a new company. The corporation is to be known as the Riker & Hegeman Company. No details as to when the combination is to become effective have been given out but October 1 is said to have been decided on… At the time Hegeman & Co was capitalized at $6 million and Riker & Son at $2.5 million. John H Flager, president of Hegeman will be president of the new organization… The result of the combination and probably what brought it about is the desire to abolish competition between stores in both chains. In several spots of the City, Riker and Hegeman have stores on opposite sides of the street. Establishments in such close proximity will be given immediate attention, according to plans, and expenses reduced by closing down one or more in a neighborhood… It’s quite likely the new corporation will expand it’s retail business to other cities with a view of ultimately opening a chain of sores across the country. Just before the merger, Hegeman had a main store at 200 Broadway, 19 branch stores (17 in NYC, 1 in Jersey City and 1 in Yonkers) and a warehouse at 66 W 132nd Street. Riker had 25 stores in the NYC vicinity and several in Boston. In 1916, Riker-Hegeman merged with the United Drug Company resulting in a company with 152 retail drug stores. The bottle I found is a small (approximately 4-5 oz) medicine with an applied finish. Embossed in small letters under Hegeman & Co are the words” a corporation”. This indicates that it was manufactured between the early 1880’s when the company incorporated and 1910 when it merged with Riker & Son. The applied lip tells me it probably skews more toward the earlier years. The business started around the mid-1870’s and was still active well into the 1950’s. Between 1876 and 1894 Frederick Haas appeared in the NYC Directories listed as drugs at 266 Fourth Avenue (at 21st Street). In 1896 the Haas Pharmacy name was included in the directories for the first time and two locations were given, 266 Fourth Avenue and 439 Fifth Avenue (at 39th Street). According to the January 13, 1905 edition of the New York Times, the Haas Pharmacy of New York incorporated at that time. The directors were Frank Rudd, J.N. Blair and L.F. Staar of New York. Frederick Haas was not mentioned so apparently he had left the business by this time. Around the same time, the 1905 ERA Directory indicated that the Fifth Avenue store provided services in the following categories: drugs and medicine, drug sundries, books or stationary and that the store had a soda fountain. The Fourth Avenue store provided drugs and medicine, drug sundries, tobacco or cigars and books or stationary. The 439 5th Avenue location moved to 7 W 38th Street around 1907. The 266 Fourth Avenue location moved to 38 E 22nd Street around 1913. Both the Fourth Avenue and E 22nd Street addresses were listed in 1913. The 7 W 38th Street location moved to 28 W 38th Street around 1913. Haas Pharmacy continued to be listed at various locations well into the 1950’s. The 38 E 22nd Street location was still listed in the 1933 Manhattan Telephone Book along with 35 E 49th Street. Between 1940 and 1945 I found them at 376 Park Avenue and in 1957 they’re located at 812 Madison Avenue. There’s actually a Haas & Thomas Pharmacy today on E 65th Street in Manhattan but I’m not sure if there’s a connection. 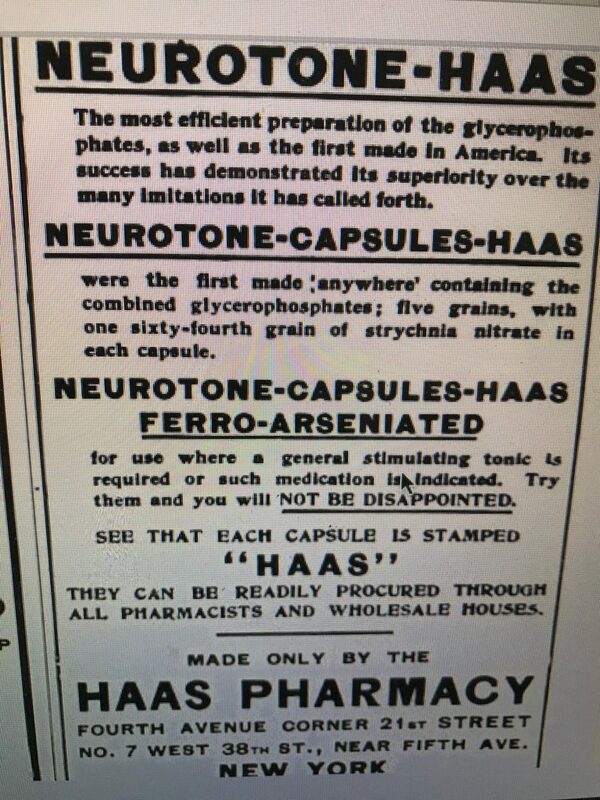 In addition to being a retail druggist Haas apparently manufactured drugs for distribution as well. Advertisements for “Neurotone-Haas, a glycerophosphate of lime and soda, appeared in several of the drug trade journals between 1904 and 1907. In and around 1914, the Court of Special Sessions dismissed a case against Frederick Haas, who was charged with violation of the NYS labor law for failure to file a certificate of the working hours of his clerks with the Commission of Labor. This decision resulted in the Water Bill, which provided the state pharmacy law and not the NYS Labor Law, has jurisdiction over the practice of pharmacy in NYS and can therefore prescribe the hours of employment for drug clerks. The state pharmacy law at the time limited the hours of employment by drug clerks to not more than seventy hours in a week or 132 hours in any two weeks. (Yikes!) The labor law at the time required one day of rest in every seven for all employees of mercantile establishments and factories. The only building that appears to date back to the business is located at the 28 W 38th Street address. It’s a turn of the century building with a commercial store at street level. The former 7 W 38th Street location is now within the footprint of Lord and Taylor’s flagship store on Fifth Avenue that opened in 1914. Fourth Avenue is now Park Avenue South. The bottle I found is a small (approximately 4 oz) medicine with a tooled finish. Its simply embossed Haas Pharmacy with no address. It was probably made in the late 1800′ s or early 1900’s and associated with one of their early locations, either Fourth Avenue or Fifth Avenue ( filled and sold by a guy working 70 hours a week!). 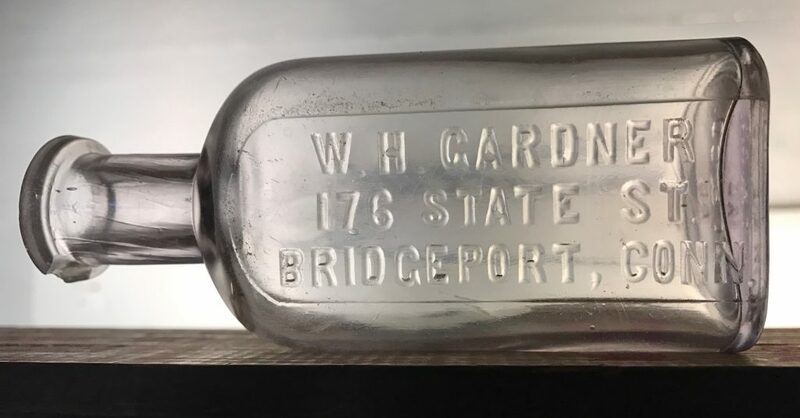 W. H. Gardner, 176 State Street, Bridgeport, Conn.
W H Gardner, Druggist No 176 State Street – One of the most successful and flourishing pharmacies in the City of Bridgeport is that of Mr. W H Gardner at 176 State Street. This gentleman is a native of this state and for many years was the occupant of a responsible position in the wholesale drug house of Hazard, Hazard & Co of New York. Having by a long course of arduous study and a practical training in the laboratory, fitted himself for the responsible profession in which he is engaged. In 1886 he established his present business and from the start secured a large and first class patronage. The store he occupies is centrally located, elegantly arranged and handsomely fitted up with artistic counters, shelving, plate glass, show windows and cases, marble soda fountain and is provided with all that can promote the comfort and convenience of his customers. The stock embraces a large and carefully selected assortment of pure fresh drugs and chemicals; proprietary remedies of well known and established reputation; toilet and fancy articles, perfumery and druggists’ sundries, physicians and surgeons’ supplies; extracts, acids and essences; roots, herbs and barks; tinctures, etc. Mr. Gardner makes a specialty of toilet and fancy articles, and French, English and American perfumes and powders and in these lines his assortment is unrivaled in Bridgeport for variety, quality and quantity. Particular attention is given to the compounding of physicians’ prescriptions and family recipes, and every care is taken to secure accuracy while the prices charged are invariably moderate. Skilled and experienced assistants are employed and prescriptions are filled at all hours of the day or night. Mr. Gardner possesses fine business ability and is popular with all classes of the community. 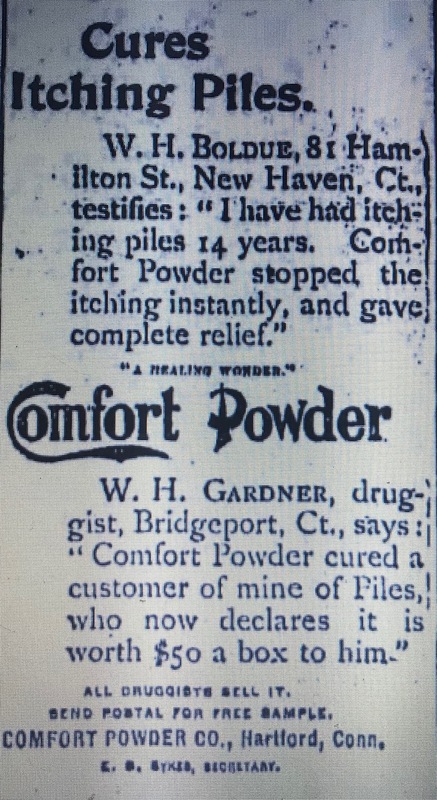 According to the Bridgeport directories, Gardner was in business from 1886 until 1912. He remained at 176 State Street until 1898 at which time he moved to 119 State Street. In 1900 he moved again, this time to 215 State Street, where was listed through 1912. Gardner’s wife Katherine was described as a widow in a 1918 newspaper story, so I assume he passed away sometime between 1912 and 1918. 176 State Street no longer exists and today it’s former footprint is within a park called McLevy Green. 215 State Street still exists today. The year 1896 is imprinted on a large stone of the building so it looks like Gardner moved there within a few years of the building opening. The bottle I found is small (maybe 3 oz) with a tooled finish. It has the 176 State Street address embossed on it. Embossing on the base indicates it was made by the Whitehall Tatum Company (W.T. Co). The fact that there’s an ampersand (between the T and Co) indicates it was made before that business incorporated in 1901. A web site article on Whitehall Tatum puts the specific embossing in the 1880 to 1895 time frame. 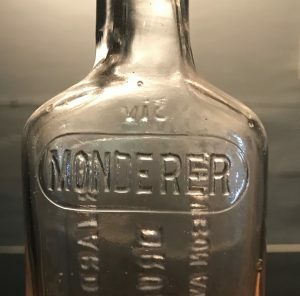 Recognizing that the business started in 1886, the bottle probably dates between 1886 and 1895, but absolutely no later than 1898, when they moved to 119 State Street. Charles S. Erb, Pharmacist, 121 Amsterdam Avenue, Cor 65th St., N.Y. While working as a clerk in the drug store of G F Werner Mr. Erb took a full course at the College of Pharmacy, graduating from that institution in 1886. He speedily worked his way up to trusted manager of a pharmacy, and around 1890 concluded to embark in business for himself. In 1891 he opened the store at 121 Amsterdam Avenue, and by his originality and push he has succeeded in making his establishment one of the features of his neighborhood. He has already attained considerable local celebrity as a manufacturing pharmacist. Erb was listed in the NYC directories as a druggist at 121 Amsterdam Avenue up through 1905. The 1905 ERA Druggist Directory listed the services he provided under the following headings: Drugs and Medicines, Drug Sundries, Tobacco or Cigars and Books or Stationery. He was also listed in that directory as a manufacturer of proprietary medicines. On July 1, 1906 Charles S Erb will move from his present location at Amsterdam Avenue and 65th Street to a new store at 108 Amsterdam Avenue between 64th and 65th Streets. The building now occupied by Mr. Erb is being torn down to make room for a public school. The business remained listed in the ERA Druggist Directories at 108 Amsterdam Avenue up through 1913-14. Erb passed away in February 1914. His obituary, in the March 1914 Issue of the “Pharmceutical Era,” stated in part that he was ex-president of the New York College of Pharmacy Alumni Association, a trustee of the College of Pharmacy, and at one time secretary of the New York State Board of Pharmacy. Today, the Fiorello LaGuardia High School of Music occupies the west side of Amsterdam Avenue between 64th and 65th Streets. It’s located in a modern high-rise building that takes up the whole block. There’s no sign of the building that housed the Erb business. The bottle I found is a small (approximately 3 oz) mouth blown medicine with a tooled finish. It has the 121 Amsterdam Avenue address so it’s manufacture date ranges between 1891 and 1906.